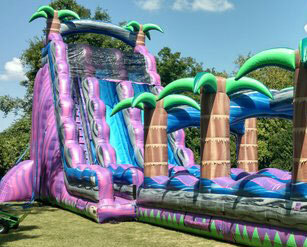 Formerly Jump Jump Bounce, we have grown to be Big Thunder Events and we have been serving Murfreesboro TN, Nashville TN, and most all of the Middle Tennessee area since 2005 with the highest quality of Inflatable Rentals. 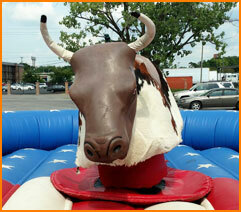 If you're looking for high-quality inflatables in Nashville, you've come to the right place! 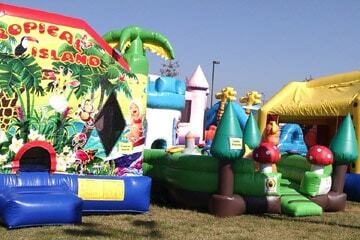 We have a great selection of inflatable bounce houses for rent in greater Nashville and surrounding communities. 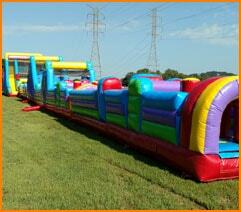 Perfect for birthday parties, school carnivals, church festivals and corporate events in Nashville. 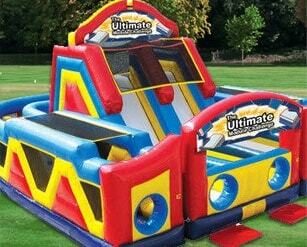 We have a great selection of large bounce house rentals including obstacle courses for rent, Inflatable Boxing , and Trackless Train Rentals. Make it a "Movie Night" with one of our great Inflatable Movie Screens. So, Grab some popcorn and call it a night. Invite the whole neighborhood for a block party to be remembered! 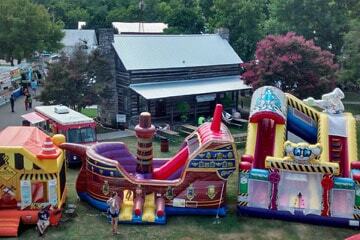 The State of Tennessee Regulates Inflatable Companies. 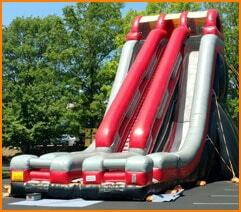 When you are shopping for inflatable attractions, insure that the company you choose is operating legally. Click the icon to seecompanies registered with the Department of Labor and Workforce development. 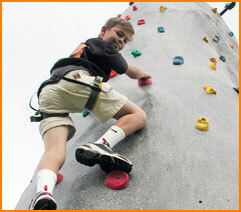 Our mobile rock climbing wall is one of the most popular and effect attraction rentals around. 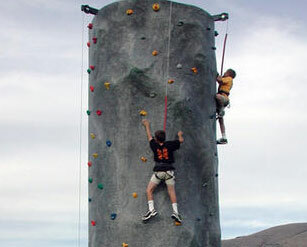 Big enough to be seen for blocks and great for all ages.The 24ft tall rock wall is available fully sttafed for your event. 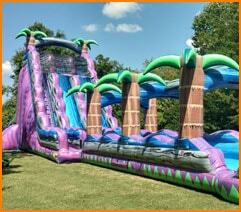 Big Thunder Events has Nashville's best selection of awesome water slide rentals just itchin' to turn your event into a wet & wild time. 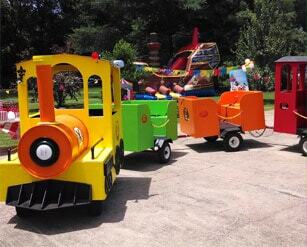 Their giant size and colorful themes will make them your centerpiece attraction. 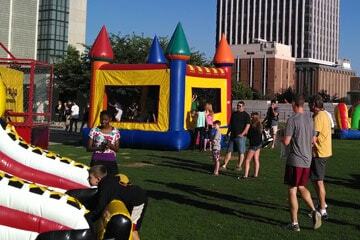 Water bounce castles are fun! 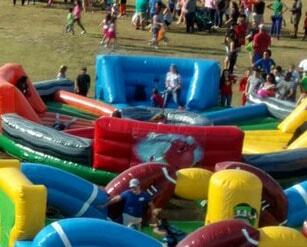 Pump up the adrenaline at your next event with one (or all) of our interactive games. 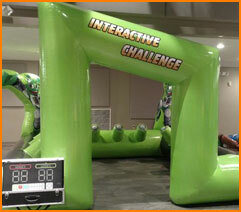 These inflatable skill challenges are great for all ages and provide opportunity for your guests to engage in group activities. Our Bull "Reckless" is known for having a bad attitude, and we're ready to turn him loose on the cowboys and cowgirls of Nashville to try and tame him. 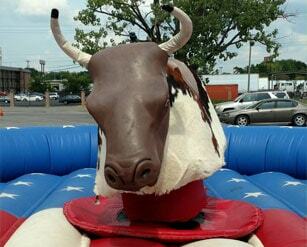 Hold on for 8 seconds and you just might win this rodeo! 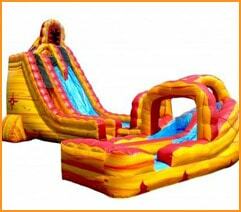 The perfect team building activity or church group fundraiser, our obstacle course rentals are as much fun to watch as they are to participate. 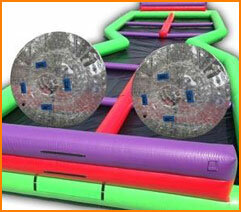 Watch as players crawl through tunnels, navigate barriers, then climb and slide to the big finish! Get this charming locomotive for your event or nieghborhood celebration and you have the classic people mover running on time. 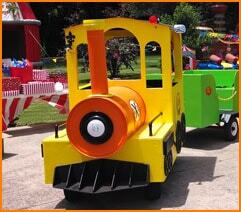 Our train comes with it's own engineer and can be operated on most surfaces with ease.